WASHINGTON (PAI) – Showing solidarity across continents, a group of U.S. unionists, members of the National Domestic Workers Alliance (NDWA), made it quite clear to India’s ambassador to the U.S. that his nation’s diplomats should stop treating their own domestic workers – who are also Indian – as serfs. Their Jan. 29 protest, outside the Carnegie Institution of Washington’s downtown offices, where the ambassador spoke, called attention to a case that roiled relations between the U.S. and India while exposing domestic worker exploitation in India itself. In that case, New York officials indicted Indian consular officer Devyani Khobragade for mistreating domestic worker Sangeeta Richard, forcing her to work long hours for low pay and intimidating her when she complained. India retaliated by transferring Khobragade from its New York consulate to a United Nations job. The U.S. treats the UN like a foreign country, making Khobragade immune from prosecution. 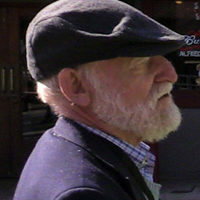 That transfer left Richard out in the cold and prompted NDWA to brave the cold in D.C.-the high that day was 20 degrees – to protest. Indian and Pakistani domestic workers’ unions supported NDWA’s campaign for domestic workers’ rights in California. NDWA members, UAW staffer Doug Meyer and Institute for Policy Studies workers picketed the ambassador’s speech, handing out leaflets explaining the mess. Passers-by backed them and a tractor-trailer added a loud supportive horn blast. An AFL-CIO staffer went inside to confront the ambassador during a Q-&-A session. “The domestic worker is an Indian national, and we are saying all workers should be treated equally,” regardless of nationality, said Tiffany Williams of NDWA. “This gives back to the Indian domestic workers for supporting us. Domestic workers have very few rights all around the world, so we’re using this as an opportunity to open people’s eyes to the issue,” she added. The Indian embassy strongly protested the New York action against its diplomat, saying the state officials’ intervention overrode Indian national customs. It had no comment on the NDWA protest. 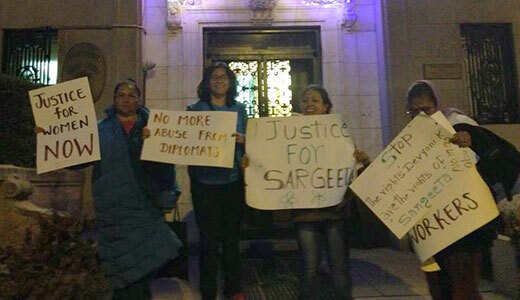 Photo: Standing for justice for all domestic workers at the Indian Consulate in D.C., December 23. National Domestic Workers Alliance Facebook page.